This month our team here at Sec-Pro has released our new capability statement corporate brochure. The purpose of this corporate brochure is to provide our customers with a clear and precise understanding fo what our core business capabilities and services are. 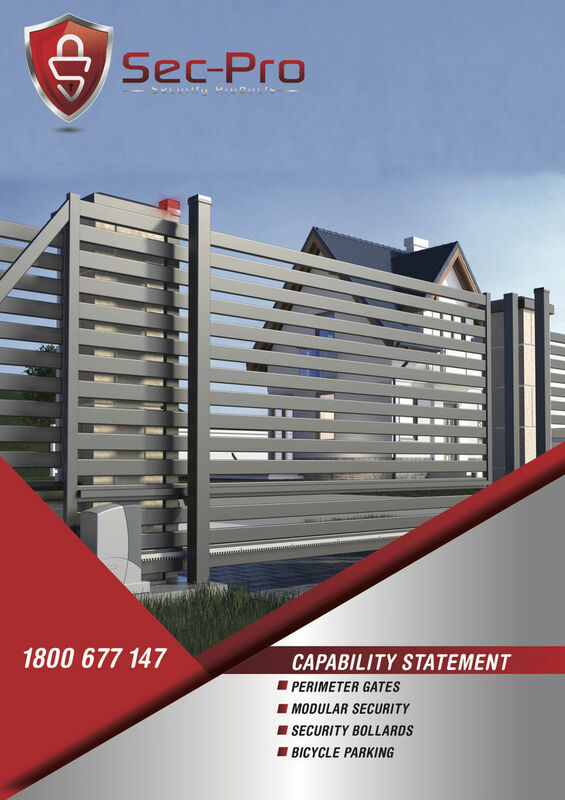 Sec-pro offer a wide range of fabricated vehicle and personnel gates, gate hardware and gate automation products, boom gate and chain barriers and a range of external and internal pedestrian turnstile products. Sec-Pro's modular perimeter security solutions are the perfect answer for all mine, construction and work depots sites that require a temporary, relocatable of full time security and access control measures. These units can be integrated to all major access control systems, drug and alcohol and induction software to ensure authorised users are granted site access. These relocatable units can be simply lifted off a flat bed truck and dropped in to operation with a forklift, tele- handler or crane and setup in a matter of hours. 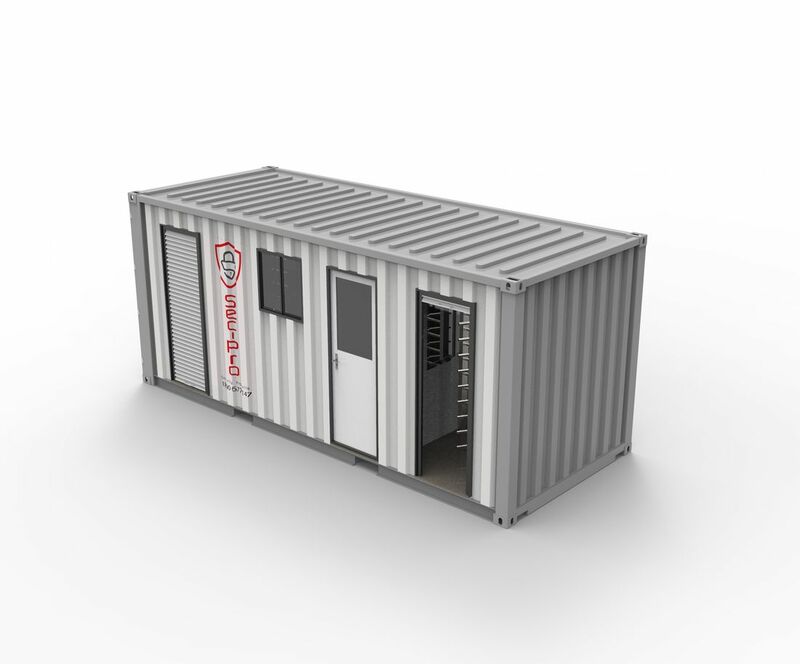 De-commissioning the units and relocating them to your next site has never been easier. 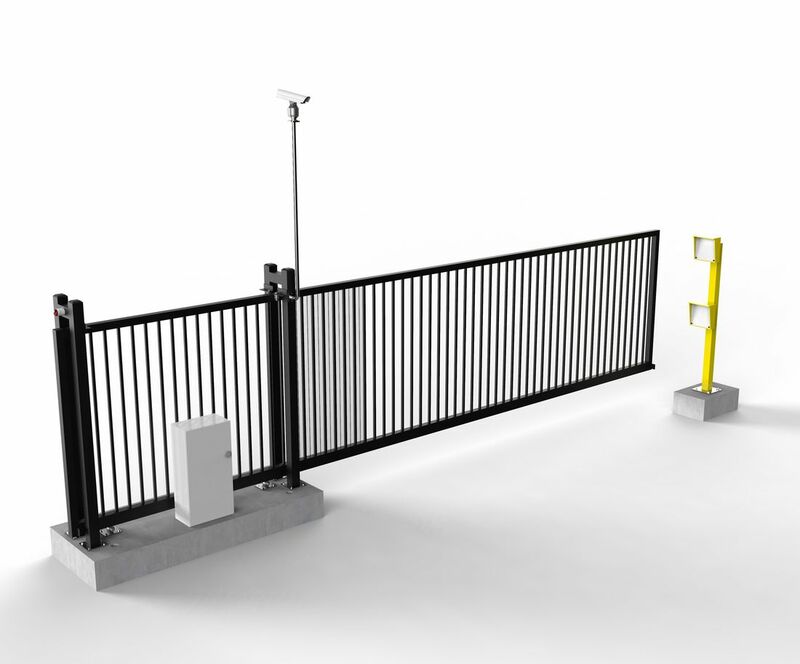 In our modular range we can provide, portable cantilevered gate solutions, mobile boom gates, turnstile containers and more. Our bollard range accomodate's for all types of requirements, from economical park and reserve bollards, shopping centre entrance and carpark bollards and architectural urban design bollards. 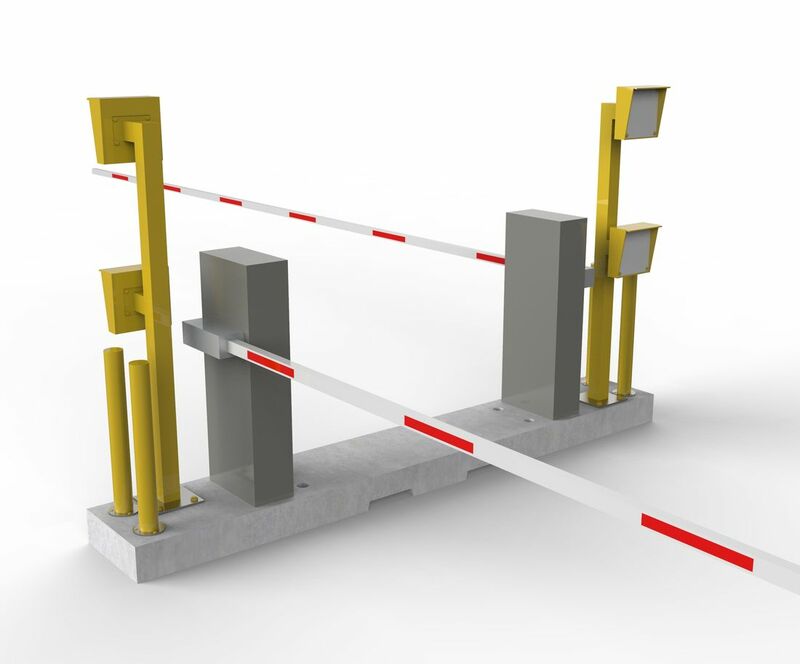 We also specialise in ram raid and impact rated hostile vehicle mitigation bollards which provide a high level of security against vehicle born attacks in densely populated areas. In-ground bollards, base plate bollards, removable bollards, manual and automated retractable bollards, high security bollards and hostile vehicle mitigation bollards completes our range. Our commercial bicycle parking range is available in both vertical and horizontal loading positions and meets the current Australian- Standard AS2890.3. All of our bicycle parking products are fully welded and offer the highest level of security against theft and vandalism. Commercial bike parking includes, horizontal bike parking, vertical bike parking, bike repair stations and end of trip facilities. Sec-Pro's bike parking range is compliant to the current Australian standard AS2890.3 providing green star compliance. If you would like to know anymore about Sec-Pro's capabilities, please contact us today. 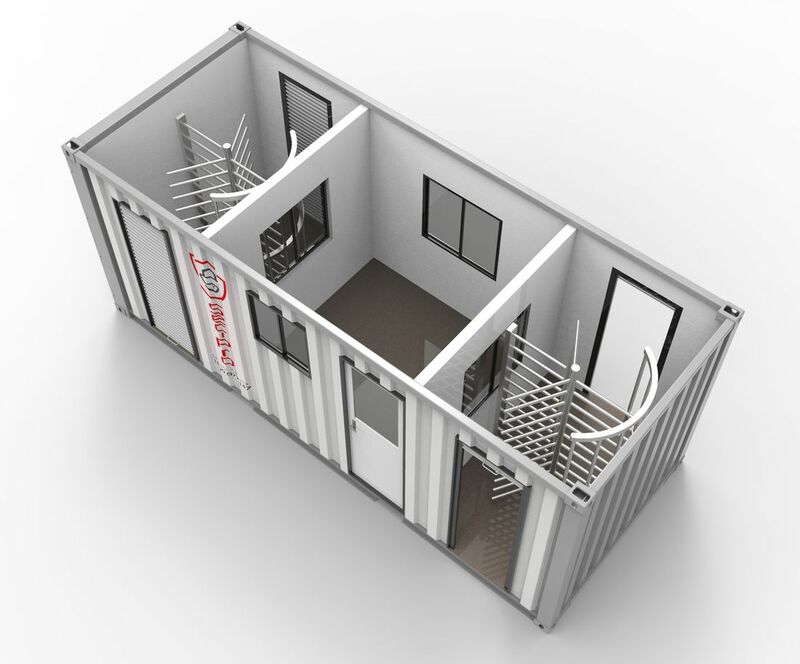 Sec-Pro's modular perimeter security solutions are the perfect answer for all mine, construction and work depots sites that require a temporary, relocatable of full time security and access control measures at the fraction of the cost. These units can be integrated to all major access control systems, drug and alcohol and induction software to ensure only authorised users are granted site access. These relocatable units can be simply lifted off a flat bed truck and dropped in to operation with a forklift, tele-handler or crane and setup in a matter of hours. Changing the face of the bollard industry. Our team here at Sec-Pro like to continually challenge and improve on our product range, so the challenge this month was to improve the look of our standard bollard selection. Sec-Pro has identified that security bollards are frequently used as the first line of defence in crowded locations or at the main entrance to some of the major commercial buildings and shopping centres in our cities. As a team we decided it was our job to improve the aesthetics of our standard bollard range, whilst maintaining a competitively priced product. Our Western Australian design team come up with the winning design. 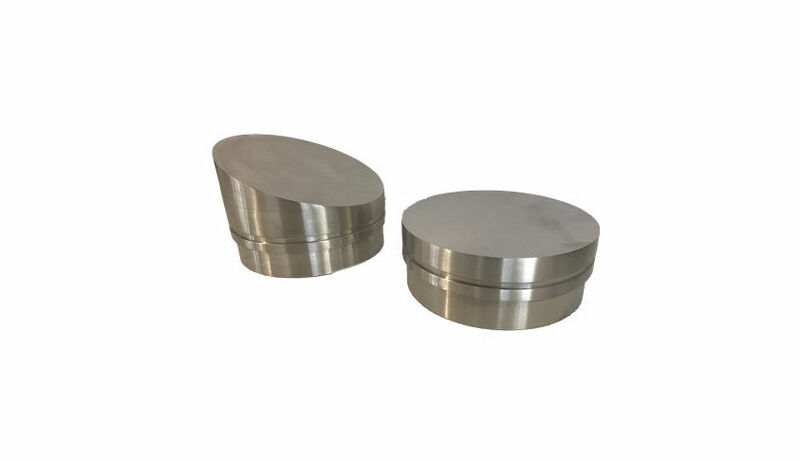 Not only providing us with a simple elegant solution, our team also featured two options in a flat cap insert and and a sloped cap design in 304 stainless steel. 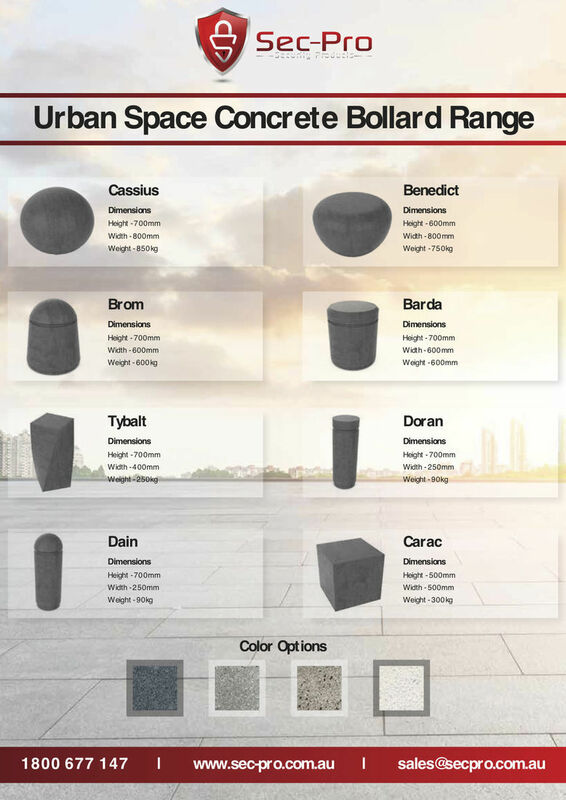 If you would like to find out more about our urban design bollard range, simply click here otherwise contact us and one of our friendly team will assist you in your enquiry. Our team here at Sec-Pro has developed a new range of urban space concrete bollards. The main purpose for concrete bollards is to provide a safe barrier around a crowded space, providing pedestrians a level of protection from vehicle born incidents or attacks. Architectural urban space projects are growing increasingly popular throughout our major cities, so our team at Sec-Pro decided we would like to offer a range of aesthetically pleasing concrete bollard solutions. Fixed or removable concrete bollards are available and we can even provide a certified structurally engineered impact rated solution of 3500kg@38km/h for the high risk security applications. This concrete bollard range is inspired by the medieval age, honouring there concrete craftsmanship and featuring some of the popular names from those times. There are 8 unique concrete bollard designs to choose from and they are available in our standard concrete colours and can be customised to suit your requirements. If you would like to find out more about our concrete bollard range, please contact us today.